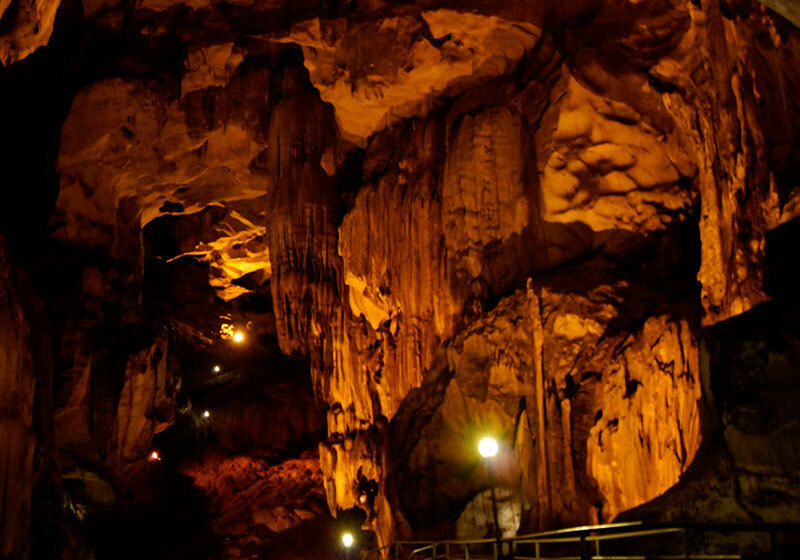 Located in Gopeng, about 24km south of the capital city of Ipoh in Perak, this limestone cave is one of the largest in Peninsular Malaysia. Although not as big as Niah Cave and Mulu Cave in Sarawak, beginners to caving exploration will be glad to know that this cave is easy to explore. The tunnel of the cave runs from the east to the west covering a distance of about 2km under the limestone hills known as Gunung Tempurung and Gunung Gajah. It is made up of 5 large domes and is believed to have existed since 8,000 B.C., about 10,000 years ago. It comprises of five huge domes with cielings resembling cocunut shells. Each of these domes has different calcium formations and marble there exist in differing temperatures and water levels. These caves are famous for its breathtaking gallery of stalagmites, stalactites and other amazing rock formations that are superb speleological wonders, found only in this part of the world. Short Description: Gua Tempurung is a cave in Gopeng, Perak, Malaysia. It is popular among spelunkers, or caving enthusiasts. About 3 km long, it is one of the longest caves in Peninsula Malaysia. Part of it has been developed as a show cave with electric lighting and walkways and there are a range of tours of different lengths and difficulty.